The Amazon Jungle is a large, flora filled jungle from The Super Mario Bros. Super Show! episode "Jungle Fever". The bulk of the Amazon Jungle is filled with virtually untouched jungle, with rivers and gorges, such as George's Gorge, being seen in it as well. A small village of Mushroom People and a few Humans is also located in the Amazon Jungle; aside from these two aforementioned species though, it is unknown if any other creatures inhabit the Amazon Jungle. 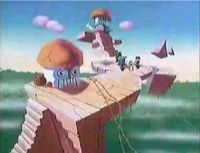 Some old ruins and stone structures, one of which was temporarily used by King Koopa as a base, were also shown to be in the Amazon Jungle; when these ruins or structures were made, along with by who, remains unknown. The Amazon Jungle is based upon the Amazon Rainforest, another large, tropical forest located on Earth. On the Netflix listing for this episode, this area is referenced as the Ama-Zone Jungle. This page was last edited on March 30, 2019, at 21:33.